If you happen to find this book in audio, don’t hesitate to listen. It’s hilarious. Bourdain is a man of many talents, and one of them is picking up slangs in different languages quickly and adapting to accents. Like I said, hilarious. That last one is his personal favorite saying. There’s no room for pretension in good food. Well, his exact words are “there’s no room for pretentious assholes in my kitchen“–same difference. His back-to-basic take on food, at the time this book was written, was revolutionary. And it’s coming from an experienced gourmet chef too. The public was just shocked and amazed because this was around the time the “celebrity chef” was born (and how we all cringed while facepalming). So by taking a stand against all that blatant advertising and product placements, Bourdain got the public’s attention and he didn’t disappoint. If you have ever worked in a restaurant, there isn’t anything in this book you don’t already know. You might recognize a few of the characters due to having worked with or screamed at or wished you could have stabbed at one time or another during your time as part of the kitchen staff. You might even see yourself in the book somewhere. The point is the things in this book are an open secret. The term “restaurant secrets” is an oxymoron. Restaurant people talk a lot because that’s what happens when you share such a high stress environment and tight confining space that’s littered with sharp pointy blades. You talk and overshare to take the edge off. That’s the impression I got from this book, that it’s meant to be a snapshot of life in a restaurant kitchen. What Bourdain did by writing a tell-all memoir about the life of a chef running a popular restaurant is nothing new. Lots of chefs before him have published similar books with similar contents detailing their childhoods, education, training, first jobs, first restaurants, rise to fame, etc etc, but none had the sense to tell it like it really is. How Bourdain writes is what sets him a part from the rest because he favors laying out the truth over romanticizing suffering. His writing style is subversive and inflammatory, of course, and offensive at times because it’s meant to drag myths surrounding the restaurant business out into the open and flaying them. The most popular myths is one we’re all familiar with, and that’s the idea of opening a restaurant for personal enjoyment. Many people still carry this romantic notion of running their own restaurant. Some day, they say. Because I just love to entertain, they also say. Besides, it’ll be fun. Like throwing a party every single night. So romantic… until these people realize they have to do inventory, order food, prepare necessary items ahead of time, keep tight schedules in their heads, make sure food and supplies show up on time, make sure staff show up on time, make sure every table in the front is looked after, make sure vendors aren’t ripping them off, make sure the cooks aren’t trying to kill each other. Every single day. Not so much like a party now, is it? This is hard work. Romantics aren’t cut out for such work. If you’re gonna open a restaurant… don’t. Just don’t. 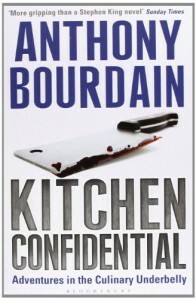 I think what really made this book a big seller were Bourdain’s detailed firsthand revelations of all the failed restaurants he worked in and witnessed in the past. The thing they all have in common? Lost of control. Bourdain’s CV is literally full of failed restaurants; some were once famous attractions, others never had a chance. He hadn’t been able to save any one of them. His writing, like his presence on his travel shows, is strangely erratically honest. It’s the kind of honesty that you rarely see or hear anymore. It’s the kind of honesty you get from people who’ve been to rock bottom and stayed a while. It’s the kind of honesty you get from an addict, former addict in this case. The prose is bold yet within reason, vile yet heartfelt, punchy yet smooth, and oftentimes uncomfortable yet engaging, but it’s also sincere like the kind of honesty you can trust. It makes you believe he’s telling the absolute truth, that he wouldn’t hold back to save face or feelings. That’s just the kind of guy he is, the book seems to say. There’s an ugly truth at the end of every one of his stories that make them more than just tales worth reminiscing over a pint. There’s pain, suffering, wisdom, blood, sweat, tears, hard liquor, cocaine, years of insomnia, crunchy aspirins, unemployment, the sights and sounds of reaching rock bottom in all of his stories. That’s as close to the truth as a memoir can get. "So who the hell, exactly, are these guys, the boys and girls in the trenches? You might get the impression from the specifics of my less than stellar career that all line cooks are wacked-out moral degenerates, dope fiends, refugees, a thuggish assortment of drunks, sneak thieves, sluts and psychopaths. You wouldn’t be too far off base. The business, as respected three-star chef Scott Bryan explains it, attracts ‘fringe elements’, people for whom something in their lives has gone terribly wrong. Maybe they didn’t make it through high school, maybe they’re running away from something-be it an ex-wife, a rotten family history, trouble with the law, a squalid Third World backwater with no opportunity for advancement. Or maybe, like me, they just like it here." I feel like this review needs to end on a positive note because this book wraps up with an unexpectedly positive yet realistic perspective that cooks and non-cooks can relate to, but I haven’t a clue what more to say.